For India, it took the shape of Hindu right-wing and their counter-imposition of a false construct of Hindu and Indian identity. The irrelevant political force of Hindutva took the centre-stage, asserting its claim on the identity of ‘Indian-ness’ and ‘Hindu-ness’. And like any two compatible hegemony, down the lane, there were a political pact between the two. Once it was realised that the gullible globalised middle-class can be bought and bribed and made to want almost anything with enough packaging and with enough lucre, the only question remained how long it would take. To be aware of one’s own identity, one needs to be immersed among the others. I was acutely reminded of this maxim a few days back when, being in the New York Metropolitan area, the heart of the ‘West’, I started to be bombarded by my non-Indian friends regarding Diwali. The cherry on top of the cake was, of course, President Obama’s felicitation for the ‘Hindu festival of light’ called Diwali. The clamour and bustle was so overwhelming that one would rather be silent and accept the imposed congratulatory notes, rather than being open about what is going on one’s mind. In spite of being born in a ‘Hindu’ family, I first heard of Diwali when I was around twelve. It was never observed in Kolkata and it arrived there riding the blooming advertisement industry of crony big businesses consisting unfamiliar words like ‘Dhanteras’. The twenty first century was around the corner and so was the obligation of local to have its face painted with the globalised gloss. The repackaging of every identity and every culture under the guise of a city-bred multiculturalism was the order of the day and nothing remained untouched. Diwali was certainly not a pan-Hindu or pan-Indian festival as it is projected these days. When Diwali arrived to Kolkata, I remember the derision and ridicule it faced from the generation of my parents who were happy enough with their Kalipuja and didn’t want to replace it with the new-comer. Kalipuja, the worshipping of the goddess Kali, was in itself a festival prominent enough to be taken note of, without the association of another form of festivity being celebrated in other parts of the country. And yet the journey from “Shubho Shyamapuja” (Happy Kalipuja) to “Happy Diwali” had begun and as with rest of the brands of pan-Indianness, the concept of Happy Diwali was also peddled and blasted into the consciousness of the city. The ludicrous ‘Dhanteras’ became an opportunity to shop for jewellery with the money they don’t have. It was obvious that the ridicule was turning into cheer and applause slowly yet unmistakably. “Forget about being a good Kashmiri girl. Start thinking about being a modern Indian woman.” – was the mandate from Aadam Aziz to his young wife. The patriarchal character of Rushdie’s celebrated novel Midnight’s children has, in a single breath, essentially depicted the essence of the formative years of the nascent nation. Throughout last century when our nation-state was still trying to find its own feet, the identity of India and Indianness was not just being shaped and perpetrated by the centre, all the peripheries of the emergent nation was contributing to the robust ideation of the novel nationhood. It was evident that if India is to survive and prosper as a multiethnic multilingual democracy, it had to accept all the servings from its different organs. The relation was always rather vibrant with each putting more elements on the table all the time, imposing its own terms upon each other, yet there was a dynamic equilibrium. Unfortunately the equation changed once the arrival of neoliberal economy became palpable. Suddenly, the modernity had a new face and its exertion seemed rather imposing. And with any such imported sense of modernity, there comes a backlash from the existent hegemony. For India, it took the shape of Hindu right-wing and their counter-imposition of a false construct of Hindu and Indian identity. The irrelevant political force of Hindutva took the centre-stage, asserting its claim on the identity of ‘Indian-ness’ and ‘Hindu-ness’. And like any two compatible hegemony, down the lane, there were a political pact between the two. Once it was realised that the gullible globalised middle-class can be bought and bribed and made to want almost anything with enough packaging and with enough lucre, the only question remained how long it would take. Today while we struggle to breathe through the immersion into homogenisation, today when “Happy Diwali” is the outcry of nation submerging all other nuanced form of celebration, we need to step back from the glow of the fireworks and retrospect for a moment. And we will realise the obvious: any import, be it of culture or otherwise, does not come cheap. It demands a depletion of our former self. Are we ready to give up? Pratik Deb is a medical doctor and former independent student activist of Kolkata, currently a doctoral researcher at Rutgers University, New Jersey. 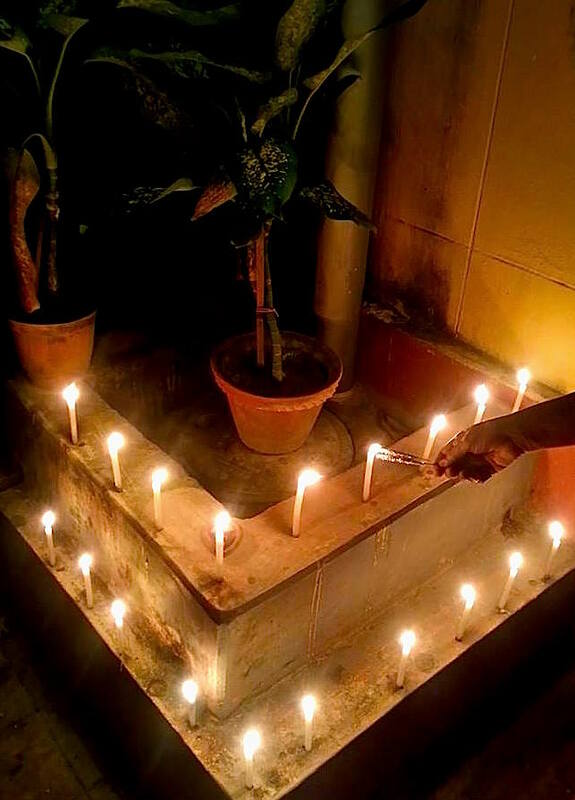 n Chittagong, we used to, and still do observe Dewali twice, once on the evening of Kalipuja (Autumn) and on some other evening in Autumn or Spring. So Dewali, Diwali or Dipavali is nothing new to us. It has always been a part of Hindu Culture in Chittagong.